Civil War Reenactors North Union States US Soldiers Cast Brass Belt Buckle. New reproduction Civil War "US" Union States belt buckle. Made of solid cast brass. 3-1/4" wide by 2-1/8" tall. See my other listings for more Civil War reproductions. 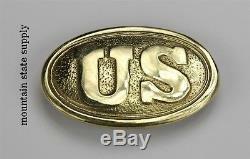 Civil War Reenactors North Union States US Soldiers Cast Brass Belt Buckle" is in sale since Sunday, February 23, 2014. This item is in the category "Collectibles\Militaria\Civil War (1861-65)\Reenactment & Reproductions\Uniforms".